Today is day 69 of 2013. How is everybody doing? It has been up and down for me. Not to worry, I am still here. :) I know I haven't been posting everyday. Honestly, there isn't much to post about. My life is pretty boring! HA. It has been a little crazy in my house the last few days. Have not been online much at all. I am starting a temp job tomorrow that will last 4 weeks. I will have what they are calling a "working interview" tomorrow morning. I will know by noon if they are even going to keep me around for the full 4 weeks. Excited and nervous! Not sure, but I believe there is a possibility for this to go full time. Either way, I am excited to be doing something and will have some money coming in! 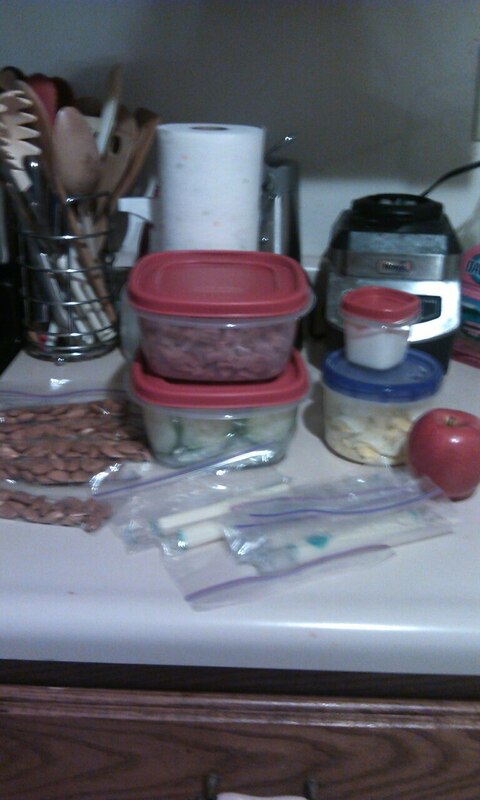 Snacks and food are prepped for the week. I will slice a fresh apple everyday to go with my cheese stick for one of my snacks. Already chopped the cucumbers, turkey and hard boiled eggs for my daily salad at lunch, this will make it really quick and easy to put together my salad in the mornings. Great day yesterday. Productive, worked out, logged my calories, drank my water. Other than that was pretty boring. Nothing new to report. Did meet with my women's bible study group. That is always nice. Only 2 more weeks and we will be done with the James study, Mercy Triumphs by Beth Moore. 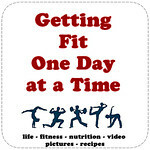 Have a daily challenge going with my Fit Group on Facebook. We all have to post a picture of one of our meals or snacks everyday. Here is mine for day 63, http://ow.ly/i/1CDTp. I realized something yesterday, it was a day I had set as a goal date and I didn't reach my goal. I had told myself I was going to lose 20lbs by March 2nd. What did I do, I immediately called my Mom who is in my fit challenge group and my biggest supporter. I reached out to her because I didn't want any negative talk in my head to derail me and I knew it could. Plus, in the past I never reach out to someone, I just bury my emotions and eat food to cover it. Well I know that doesn't work so I figured I better do the opposite! She was great, just like I knew she would be. If 20lbs was the bulls-eye my arrow hit the grass! So you know what I am doing? I am picking up another arrow and taking aim again. I have set a new goal for April 7th....lose 10lbs. Today is a rest day so I am going to get busy cleaning. My house needs it! Don't forget tonight 8pm/7pm central, The Bible Series airs on The History Channel. Day 60 of 365 Days of Blogging! Set 2 goals for myself yesterday, 1. to drink 128 ounces of water and 2. to complete Les Mills Pump Extreme. 1 out of 2 ain't too bad, right! I completed my workout but only drank half of the water I was supposed to. Drink 128 ounces of water! If you haven't noticed, I am changing up the way I post each day. Before I was waiting till the end of the day to try and summarize what I did and sometimes it was 11:30pm before I was able to post. I mean, I did have to kind of wait for most of the day to be over! Now, I will post the next morning about the previous day (which will be the title) and include goals for the current day. 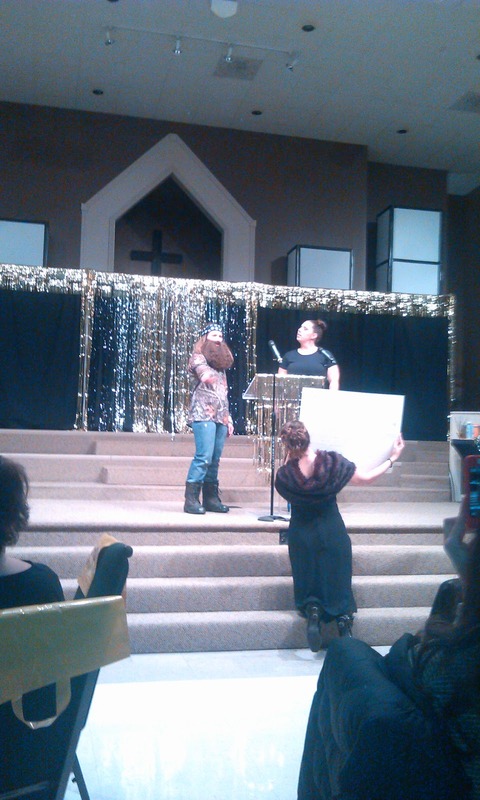 Last Night was Ladies Night at Antioch Bible Baptist Church. 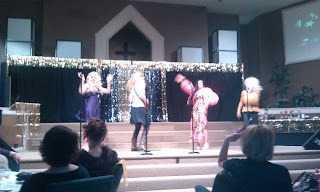 This is the first time I have had the opportunity to go to a Ladies Night and I am so glad I went. It was a lot of fun and they put on a great program. The theme was "Live on the Red Carpet" and some of the Ladies' husbands were there in their tuxes, minus the jackets, passing hors d'oeuvres and opening the door and greeting us. Very special! They had paparazzi taking pictures and a great dinner served before the program started. We had speakers talking about photography, makeup, entertaining versus being hospitable, prayer and after each topic they gave away freebies to everyone and drew names for some bigger prizes. Program and my goody bag. from Keeping up with the Kardashians presented the ABBC awards. 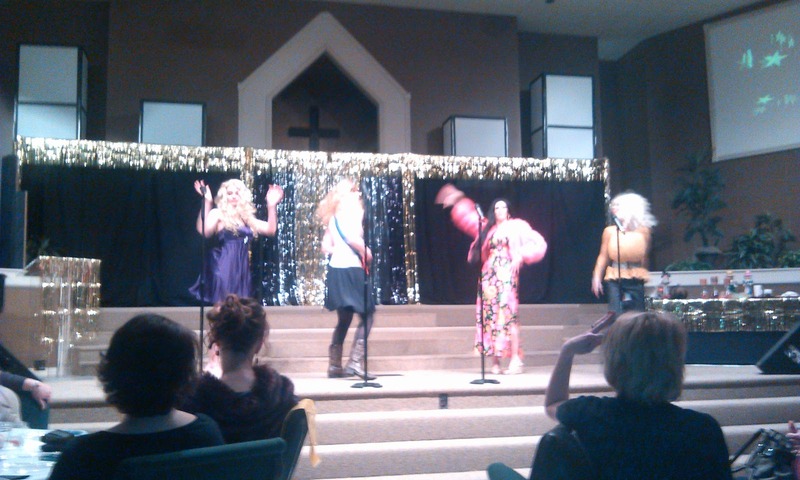 Beyonce', Taylor Swift, Cher and Dolly Parton opened the show!